A new update to the Mac-specific Taskpaper aims to add power and ease of use to work-list management —AppleInsider loads it up, and sees if it makes good on its promises. 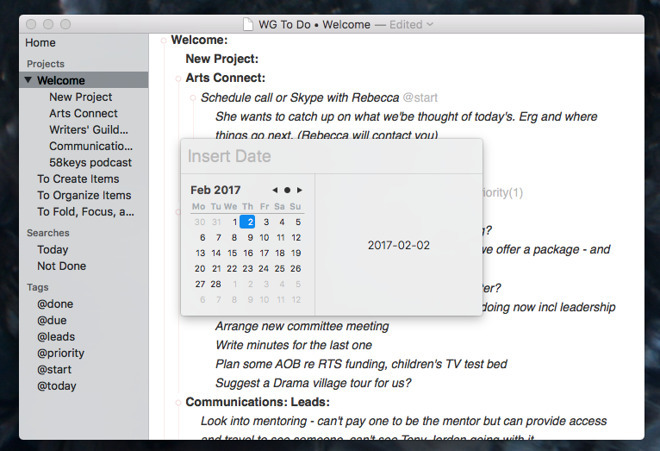 TaskPaper 3.6.2 is Mac software for managing your tasks: it is a To Do app and it's unique selling point is that it is simple yet powerful. At heart, using it is just like jotting down jobs in a notepad. Write one, hit Return, write the next. On and on for as long as you like. Nothing forces you to divide those tasks into projects, nothing tries to impose the love-it-or-hate-it "Getting Things Done" methodology. Nothing gets in the way of you writing down the tasks very, very quickly. The central idea behind Taskpaper acknowledges that you need a list to cope with all that on the plate —but that list shouldn't be yet another burden. Time spent fiddling with your To Do app is time you could be spending on doing things. Simplicity and speed is not enough if there isn't also some power behind the scenes. Writing tasks down fast is always a bonus but being able to find them again quickly is essential. As you write, TaskPaper formats To Do tasks to make finding and sorting and completing them easier. If you type a line and end it with a colon, say, "AppleInsider:" then when you hit return, TaskPaper creates a project called AppleInsider for you. On the next line, type a dash and a space then write down a job you've got to do. Hit Return again and tap the Tab button before you start writing. That creates a note. Without pointing and clicking, without selecting any menus or using any shortcut keys or gestures, you've just created a project that has a task in it —and that task has a note of what you need to know to do it. Then you hit Return again and you just keep on going creating projects if you like, tasks as you need, and associated notes if you want. There's no limit to how much you can write per item, but once you've filled the screen you're going to start having problems finding the things you need to do. So, TaskPaper can do what it calls folding —you can collapse a project down to just its heading, allowing focus on just one project and hiding everything else. Or, you can search so that TaskPaper only shows you tasks that match what you're looking for. Next to a task you've written down, type "@urgent" and now that's tagged with the word urgent. Create the tags that make sense to you and your work. TaskPaper displays them all in the side navigation bar. Then forever afterwards, so long as there are any tasks at all with a particular tag, that tag is displayed in the list and clicking on it shows you every matching To Do. You can have as many tags as you like and you can go too far with them. The temptation is to mark a task with every possible tag you might ever want to search for and TaskPaper will cope fine, but your screen will be filled with a sea of these things. Without doubt, though, you are going to use certain tags because this is how you set deadlines and due dates with TaskPaper. So, after a task you'll write something like "@date(2017-02-12)". That's not really setting a due date in the way that other task managers see it, but it is tagging a date so you can find it quickly. You can search for dates you specify or you can just click on the tags in the navigation panel. As that could very quickly turn into such a long list that it's hard to find any other tags, if you type any date at all next to a task, TaskPaper creates an @date one in the list. Click on that and you get shown all tasks that have any dates next to them at all. You've still got to look through them all or search for particular dates, though, and this is where TaskPaper's drive for simplicity hits problems. It hits the fact that To Do managing is harder than it sounds, and that this is why there are hugely powerful and somewhat complex apps like OmniFocus, Todoist and many more. The searching, folding, and focusing is excellent but you still find you're wading through a lot of tasks in TaskPaper before you can get to the point where a click will facilitate all that for you. 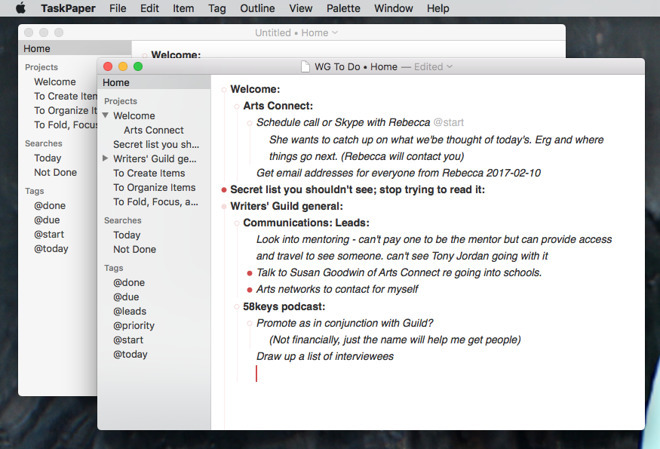 Other To Do apps will have a list of your projects somewhere, so getting to today's most important work is faster. Similarly if you planned to spend today working on tasks to do with your Acme Company but something comes up to stop you completely, it's easier to move whole lists of To Dos on to another date in some other apps. Last, it's hard to get a feel for your workload: there's no heat-map, if you like, showing that next Tuesday is murderously full but Wednesday is barren of tasks. Regardless of all that, TaskPaper's simplicity is appealing. 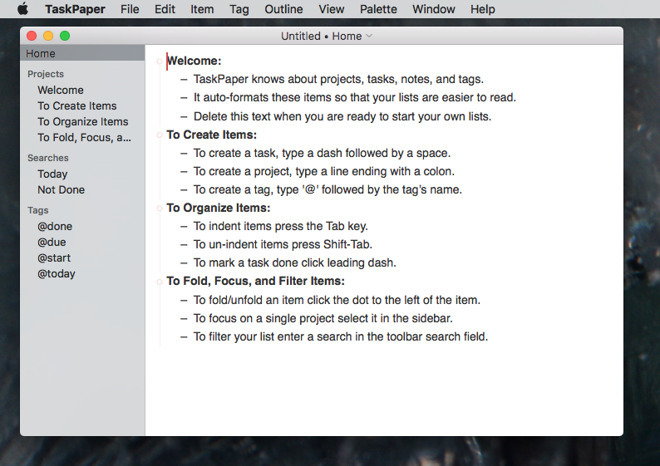 TaskPaper is solely a Mac app: there is no official iOS version. There are currently no plans for one so you're likely to end up having to find temporary workarounds as you carry To Do lists in another app, maybe write some down in a third. Yet, TaskPaper is moving away from being Mac only, it's just that it's other companies that are helping it. 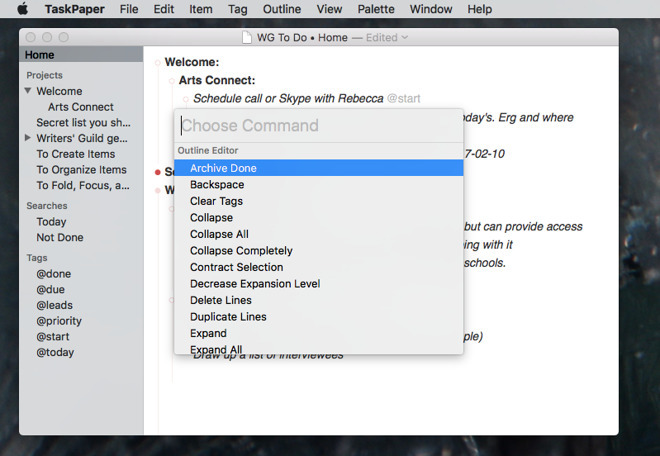 Right now the iOS app Editorial lets you write in TaskPaper format before sending your lists off to the TaskPaper app. OmniFocus can accept To Dos in TaskPaper format. There are ways to send tasks from the Fantastical calendar app to TaskPaper. One can imagine TaskPaper becoming a lingua franca for To Do apps across all platforms at some point —but it's not quite there yet. For the moment, though, the selling point of TaskPaper is its simplicity. If it being a text-based To Do app appeals, then there's little else like it. TaskPaper is priced on a par with higher-end To Do apps and it would be good if there were a trial version you could use. Unfortunately, TaskPaper isn't sold directly and only available on the Mac App Store and through the $9.99 per month Setapp service. TaskPaper 3.6.2 requires OS X 10.11 or higher and costs $24.99 on the Mac App Store.